Barry Lopez's multi-layered short story has been made into a limited edition of forty-eight copies in the summer and fall of 2005 with images and design by Charles Hobson. The slipcase has been covered with wood-grained paper to suggest the map cabinet which plays a pivotal role in the story. A metal label holder acts as a spine label. The text has been printed letterpress by Les Ferriss on BFK Rives using a Garamond Narrow typeface. John DeMerritt made the slipcase and board covers with the assistance of Kris Langan. 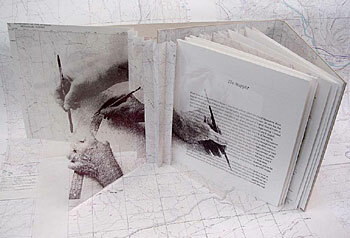 The book design and images have been created by Charles Hobson who assembled the book with the assistance of Alice Shaw. 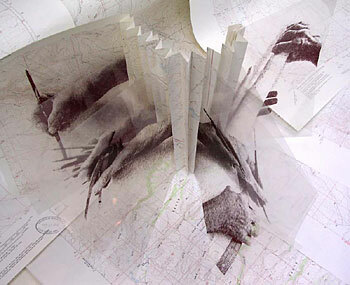 In process view of concertina spine, USGS maps and hand images on transparency film. Images of hands emulating gestures of a map maker at work have been reproduced as digital pigment prints on transparent film.